Hester Thrale's Tribulations - Thraliana! Behind every great man, so the saying goes, there is a women, and history has many examples of the influence a spouse has had over her husband in producing a positive outcome! Often her advice has proved to be the decisive factor. 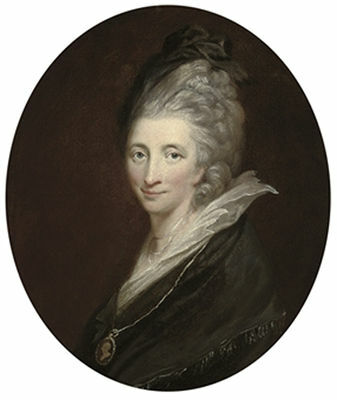 This said, in the male dominated world of late 1700's London one such women carried out something quite unique, in that through her diaries 'Thraliana' ( in six volumes) she cataloged her life married to one of the capitals most powerful brewers, Henry Thrale... her name was Hester. It offers an insight into the life and times of an intelligent and astute socialite who became acquainted with some of the great characters of the era, most notably Dr. Johnson, famed for producing the first English dictionary. She proved more than a match for the cantankerous doctor, who became so closely associated with the family that he had his own quarters within the brewery in Southwark, and at the family retreat in Streatham. His advice was often sought on the affairs of the brewery, and he delighted in Hester Thrale's intellectual prowess. Henry Thrale, her husband, had inherited the brewery through his father Ralph, who Dr. Johnson recounted " Worked for six shillings a week for twenty years in the great brewery which afterwards he would call his own". Ralph was clearly industrious, and on his death Henry would take control of the brewery. Their marriage was clearly one of convenience rather than love, but they remained loyal to one another, and the fact that Hester was socially superior to Henry vexed her husband considerably. In 1772 Hester noted her husband was agitated and distraught and begged to know the problem and unburden his mind. It took a week for him to open up to her, and eventually her mother and Dr. Johnson. He divulged that he had brewed the years requirements of ale with poor quality hops which was ruining the entire stock, and worse still had tried to brew without using malted barley but a substitute (history has always shown that barley must be the main constituent of beer as it contains the essential enzymes). 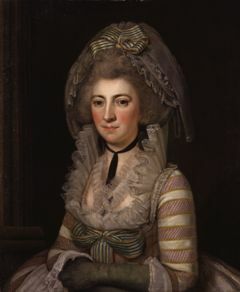 Hester Thrale in mourning, and below as Mrs. Piozzi in later life. Further he had been persuaded to build a costly copper to boil wood, all of which had gone rotten, plus other mad cap schemes. The culprit identified in offering such 'advice' was a gentleman named Jackson, who beguiled Thrale to the point that he could not be reasoned with by others within the company -to their exasperation. It was time for Hester to take control. The staff would remain loyal to her, but not Mr. Thrale who's distant seemingly uncaring attitude toward his staff had won him few admirers. Hester immediately got rid of Jackson, and along with Dr. Johnson spent the next nine years reversing the fortunes of the brewery - which at this point had accumulated debts of some £130,000, a staggering amount! This achievement was in no small part due to the managerial abilities of the Chief Clerk John Perkins, who's skills and knowledge cannot be underestimated. Sadly his 'Social Station' within 18th century society is made abundantly clear by Hester in her diaries, who often saw his attempts to advance himself within the family firm as presumptuous, an irritant, and vulgar. 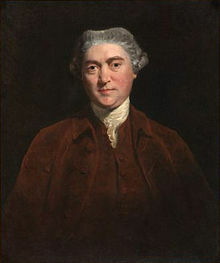 Henry Thrale above. One of his many 'inventions' was an anti fouling compound for protecting ships bottoms. After Henry's death in April 1781 Hester faced the daunting prospect of running the brewery, and although encouraged by Dr. Johnson as they had both successfully dealt with the running of the brewery in an organised manner, she felt the task too daunting in the long term. At the earliest opportunity she wished to sell it . Redemption came in the unlikely form of a Quaker, David Barclay, a member of the wealthy banking family who on seeing the sale sign whilst crossing London Bridge thought this the perfect opportunity for his nephew Robert. The sale was carried out on the 31st May 1781 ( incredibly only six weeks after Henry's death) with all the partners present. Dr. Johnson carried out proceeding with his usual zeal and aplomb! The sale price agreed was £135,000, the equivalent of over £10 million pounds in today's terms. For Hester and her five daughters the future was secure. The Barclay family on closer inspection of the books had been impressed by the way in which the business had been managed (most notably by Perkins) but astonished by Henry Thrale's lack of business sense and foolhardy waste. For John Perkins at least his devotion to the company over such a long period was finally acknowledged, as now as one of the partners, they were to trade under the name of Barclay Perkins & Company. Hester Thrale offers us a remarkable insight into the workings of the business world of the 18th century. Encouraged by Dr. Johnson to put her thoughts to paper it was her husband Henry who had bought her the six calf bound blank books that became her diary - Thraliana. 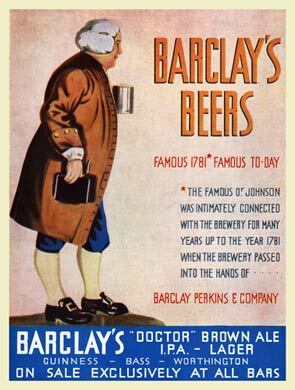 The bar sign right depicts Dr. Johnson and highlights the Barclay Perkins partnership. His image was used extensively throughout the companies history such was his standing during the Thrale era, and being present at the famous sale.